Researchers studying peptides using the Gordon supercomputer at the San Diego Supercomputer Center (SDSC) at the University of California, San Diego (UCSD) have found new ways to elucidate the creation of the toxic oligomers associated with Alzheimer’s disease. Igor Tsigelny, a research scientist with SDSC, the UCSD Moores Cancer Center, and the Department of Neurosciences, focused on the small peptide called amyloid-beta, which pairs up with itself to form dimers and oligomers. The scientists surveyed all the possible ways to look at the dynamics of conformational changes of these peptides and the possibility that they might organize into the oligomers theorized to be responsible for the degenerative brain disease. In the February 14 issue of the Journal of Alzheimer’s Disease, the researchers suggest their results may generate new targets for drug development. Tsigelny also noted that recent improvements in computational processing speed have allowed him and other researchers to use a variety of tools, including computer simulations, to take new approaches to examining amyloid-beta, which has proven too unstable for traditional approaches such as x-ray crystallography. 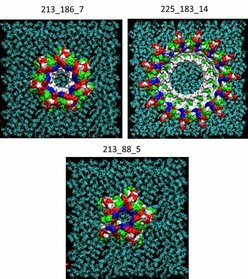 The researchers investigated the single and dimer forms of the peptide with a combination of computational methods including molecular dynamics, molecular docking, molecular interactions with the membrane, as well as mutagenesis, biochemical, and electron microscopy studies. They then looked at how those dimers interacted with additional peptides and which larger structures resulted. The researchers found that depending on their configurations, some dimers did not lead to any further oligomerization and some form toxic oligomers implicated in the development of Alzheimer’s disease. The in silico experiments allowed the single amyloid-beta monomers to associate randomly, according to Masliah. However, he noted that within the brains of Alzheimer’s patients, the formation of oligomers and fibrils depends on any number of biochemical influences such as peptide concentration, oxidation, neurotoxins, and acidity. According to the researchers, their work implicates a more dynamic role for the amyloid-beta dimers than previously thought. It also suggests that the way dimers form and then grow into larger structures is a rapidly changing process. “This, as well as previous results, suggests that targeting selected amyloid-beta dimers may be important in an effort to ameliorate the episodic memory described in mild cognitive impairment and the early stages of Alzheimer’s disease,” said Masliah. Masliah and Tsigelny’s collaborators included UC San Diego’s Yuriy Sharikov, Valentina Kouznetsova, Jerry Greenberg, Wolfgang Wrasidlo, Tania Gonzalez, Paula Desplats, Sarah E. Michael, Margarita Trejo-Morales, and Cassia Overk. As an Organized Research Unit of UC San Diego, SDSC is considered a leader in data-intensive computing and cyberinfrastructure, providing resources, services, and expertise to the national research community, including industry and academia. Cyberinfrastructure refers to an accessible, integrated network of computer-based resources and expertise, focused on accelerating scientific inquiry and discovery. SDSC supports hundreds of multidisciplinary programs spanning a wide variety of domains, from earth sciences and biology to astrophysics, bioinformatics, and health IT. With its two newest supercomputers, Trestles and Gordon, and a new system called Comet to be deployed in early 2015, SDSC is a partner in XSEDE (Extreme Science and Engineering Discovery Environment), the most advanced collection of integrated digital resources and services in the world.